The conflict between Russia and Ukraine has effectively brought contact between linguists in the two countries to a halt. If in the past they held conferences, ran professional exchange programmes, shared information and studied linguistic questions together, now they generally work in isolation. But as the conflict continues, language is constantly responding to what is happening. The linguists know that these linguistic processes need to be documented and studied, but there’s no one to do it. And the problem isn’t only in broken contacts. Scholars find it impossible to rise above the fray and engage in pure, disinterested analysis. One side (Ukraine) has, for obvious reasons, become too emotionally involved in what is going on, the other (Russia) tends to stick to the official line whenever any linguistic conflict arises. And if linguists from both countries meet at international gatherings, they restrict any discussion to neutral areas. But as time passes, more and more material is left unstudied and is lost and forgotten. “We mostly meet up in Europe; we avoid sensitive issues and don’t visit each other ‘at home’”, says Olga Severskaya, a senior researcher at the Russian Academy of Sciences’ Vinogradov Institute, the regulator of the Russian language, about her relations with Ukrainian colleagues. In the spring of 2015 she attended a conference in the Austrian city of Graz, where issues connected with the conflict were discussed, but neither Ukrainian nor Russian delegates touched on its linguistic aspects. Yevgenia Karpilovskaya, head of the Structural-Mathematical Linguistics department of the Ukrainian National Academy of Sciences, for example, spoke in her paper on “The Role of Word Formation in the ‘Architectonics’ of the Ukrainian-language Internet”, about the interconnection of online communication and other aspects of the language. The Potebny Institute of Linguistics, at the Ukrainian Academy of Sciences in Kyiv. CC A-SA 3.0 Wadco2 / Wikipedia. Some rights reserved.Severskaya tells me that she is friends with a Ukrainian colleague, but they have avoided any discussion on controversial subjects. Ukrainian and Russian linguists, she insists, have very cordial relations at conferences, as though they want to assure one another that “what’s happening is not our fault”. They still, however, don’t want to analyse this “what’s happening”. And at the same time, many contacts have indeed been lost. 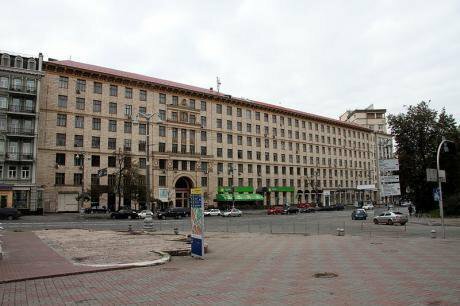 The Vinogradov Institute used to work in close cooperation with Luhansk University, but since that area came under the control of the self-styled LNR (Luhansk Peoples’ Republic) there have been no conferences held there. The institute also had close ties with other Ukrainian universities – Kherson, Kharkiv, Kyiv – but very little of that remains. Lyudmila Pedchenko, head of Kharkiv University’s Russian department, confirms this – she and her colleagues used to go on exchange programmes with Moscow’s Pushkin State Russian Language Institute and Moscow State University (MGU), and their linguists came to conferences in Kharkiv, but now everything has changed. Exchange visits are out of the question and there is little contact with Russian specialists, even at a personal level. Also, an international placement is obligatory for people studying for a doctorate, but after the conflict began, the Ukrainian Ministry of Education removed Russia from its list of potential host countries. “We can get new dictionaries and books on our subject, but only through the internet – that’s our only source of information from Russia”, says Pedchenko. “Naturally, I agree that a linguist ought to study everything relevant to their area, but I realise that in the present situation it’s not easy to be objective, to stand back. Perhaps some time needs to pass for that to happen. Any analysis of this kind requires an impartial approach, whereas we’re too close to the situation to see it objectively”. “Some people are still in personal contact, but there are no new contacts developing”, Svetlana Kuranova, a lecturer at Kyiv’s National University of Kyiv-Mohyla Academy (NAUKMA) tells me. Our university had just a few links with Russia: our postgraduates would spend time at Baikal and MGU, and one of our students got top marks there. She conducted a survey among Polish, Ukrainian and Russian students, looking at the associations the word “patriotism” had for them. But that was before 2014. It’s harder to do that now; not everyone would want to visit Kyiv. But I think it might be possible to organise some kind of internet conference”. Leonid Krysin, head of the Modern Russian Language department at the Vinogradov Institute remembers his colleague Dr Leonid Kasatkin visiting Kyiv in 2014, at the height of the Maidan. “He told us that everything was quiet and calm, and that our propaganda exaggerated the situation”, he says. “Our relations with our Ukrainian colleagues are perfectly friendly; it’s just that the general situation and the problems with air travel have made contacts difficult. We had already begun working with the Ukrainian Academy of Sciences on a large Russian-Ukrainian dictionary, but had to just drop the project – although the problem here was mostly financial; there just wasn’t any money for it”. Nearly all the linguists I asked, in both sides of the border, insisted that there was no final break: cooperation was just “on hold”. In the words of Professor Mikhail Dymarsky of St Petersburg’s Herzen University, “My contacts with colleagues in Kharkiv are currently dormant, but I could revive them at any moment, and I think they would respond immediately”. At the same time we can’t claim that there is no reference to the linguistic aspects of the conflict in the two countries’ academic or media spheres. The issue is written about, but the people that do the writing seem to be stewing in their own juice: they don’t research the issue dispassionately, but base their findings on the official position of whichever side they are on. This is particularly the case in Russia. Many of the people I spoke to admitted that when discussing the conflict they don’t stray from the “party line”. This is reflected in articles published in the last three years by the Ekaterinburg periodical “Political Linguistics”, the only serious journal in Russia that covers this field. Table of contents from “Political Linguistics”, Issue 5 (59), 2016. 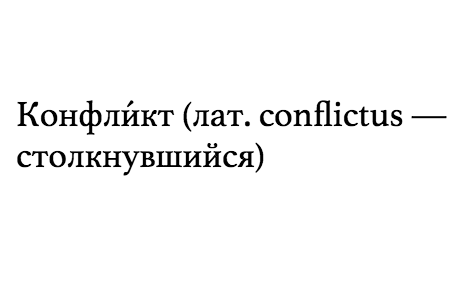 Some do indeed touch on the linguistic aspects of Russo-Ukrainian relations. But “touch on” is the operative word: it’s not easy to find material on specifically linguistic areas of the conflict. You most you can find is an occasional indirect reference in articles on Russia’s image abroad or the language used in propaganda wars. The periodical’s third issue of 2015 contained, for example, an article entitled “Xeno-stereotypes in the Linguistic World View and the Discourse of the European Parliament”. The authors’ notes suggest that this discourse needs to be studied, in order to explain the “mechanisms of stereotypical mental models and programmes that are used to influence public opinion on contemporary Russia”. The article itself states that Europeans are fed stereotypes that hark back to the ethno-psychological subconscious, and are usually based on the age-old geopolitical “lusts” of certain political writers. The same issue also had an analysis of the content of the liberal Novaya Gazeta newspaper, which its authors say embodies “a strategy of defending anti-Russian political forces: EU and USA policies aimed against Russia; cultural figures who insult Russian national consciousness and the Orthodox Faith; Ukrainian chauvinists and extremists, and NGOs, subsisting on foreign grants, whose activities are dubious in terms of our national security”. Some publications do touch on the issue of hate speech, but only with great caution. 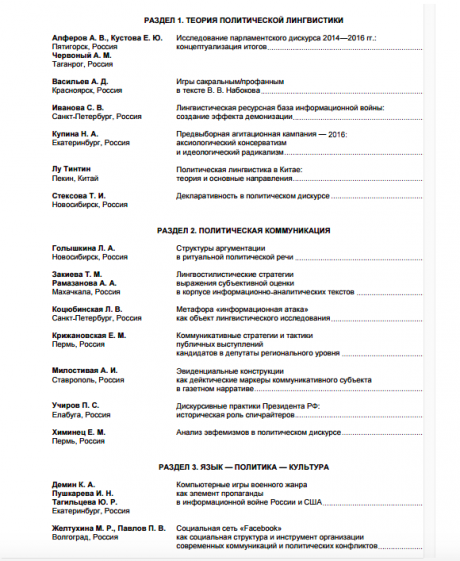 The third issue of “Political Linguistics” for 2014 contained an analysis of “the disturbing vocabulary of our time”, in other words slang expressions for ethnic groups: words such as “Moskal” (a traditional derogatory term for a Russian used by Ukrainians) and “Khokhol” (a traditional derogatory term for a Ukrainian used by Russians) that have been revived in the present conflict. The authors of the article looked mainly at students’ language and came to an optimistic conclusion: “In an educated Russian speaking environment the intentional use in speech of slangy terms for ethnic groups as an element of invective is still regarded as impermissible”. Here it’s worth looking at how how events in Donbas are described. In another article in the same issue of Political Linguistics, its author speaks of a “war” “breaking out”, as though Russia had nothing to do with it. And none of the sources I have read uses the term “annexation” in relation to Crimea – although there are articles about “Crimea’s reunification with the Russian Federation”. 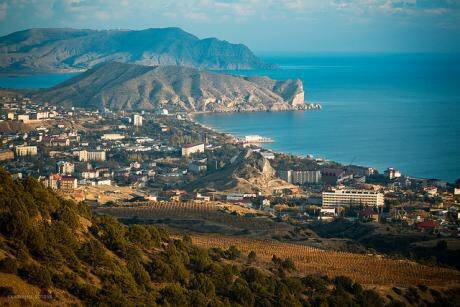 There is, on the other hand, active engagement between Russia and Crimea. Some linguists from Luhansk University, for example, moved to Crimea after hostilities began and now go to conferences at Moscow universities. Others, who have stayed in the officially unrecognised Donetsk and Luhansk Peoples’ Republics (DNR and LNR), also visit Moscow. One paper at a recent conference at MGU was entitled “A genre-stylistic profile of the public political texts of Novorossiya” [a proposed confederation of the DNR and LNR – ed.] The use of the term Novorossiya was a giveaway – the audience could immediately identify the author’s political position. Ukraine, meanwhile, has had its own slant on the linguistic aspects of the events of the past few turbulent years. But what is interesting is that it’s not linguists but mostly journalists, media specialists and public figures who are engaged with the issue. In Ukrainian towns and cities you can find seminars and lectures for media professionals on hate speech and how to avoid it. And the speakers admit that it’s not only Russian propaganda that uses defamatory language, but Ukrainian media as well. In September 2015 the Ukrainian National Union of Journalists and the independent Media Trade Union held a conference on “The Problem of Hate Speech in Ukrainian Media” (Ukrainian link) which was effectively devoted to self-criticism and self-analysis. Valery Ivanov, a professor at Kyiv’s Taras Shevchenko University and head of the Ukrainian Press Academy, pointed out that Ukrainian journalists were guilty of using hate speech themselves: “We’re always talking about explicit propaganda and defamatory language in the Russian media, but we pay less attention to the same vocabulary when it’s used by our own media. Is our job to inform - or to incite hatred? If the aim of the media is to fulfil their professional responsibility, to inform people about what is happening in our country, then we should avoid using emotive terms. This is an essential for information platforms”. Anastasia Stanko, a journalist with the Hromadske TV channel, touched on the same subject at a master class at Lviv’s Catholic University (Ukrainian link). Anastasia has reported widely from the conflict zone in Eastern Ukraine, and was even taken prisoner by an LNR militia in summer 2014. “We have laughed so much at Russian journos and so often accused them of pushing propaganda, that we have become their little shadows”, she said. “Think, for example, about the formulaic descriptions we hear on many Ukrainian channels – they are “terrorist forces”, while Ukrainian troops are “our heroes”. And anyone who is killed has the right to “fall in battle”, and not be “liquidated”. After the outbreak of war in eastern Ukraine, many faculty members from Luhansk University fled to Crimea. CC BY-NC-ND Ekaterina Sotova / Flickr. Some rights reserved.A group of Ukrainian specialists in different areas of the social sciences and humanities – philosophy, languages and literature, sociology, history, psychology, political science and communication – has also set up a portal, The Narrative of the Dignity Revolution, and plans to present a historical-semantic dictionary of the events of the Maidan at Kyiv’s annual spring book festival. As I have already pointed out, these initiatives are more often the work of journalists and activists than of linguists. But the linguists are also becoming involved in the hate speech issue. In an interview on the Ukrinform website (Ukrainian link), Ukrainian linguist Larisa Masenko spoke about how over the last two or three years, a lot of words connected with war and conflict have crept into Ukrainians’ everyday speech: “People have started using various hurtful words and phrases in their conversations. The other side talk about “Ukes” and “Maidan morons”, while we call them “potatriots”, “Colorados” [the orange and black stripes of the pro-Russians’ flags are reminiscent of Colorado beetles and from a Ukrainian viewpoint deserve the same fate – ed.] and so on. This kind of thing is unavoidable in wartime”. Those few Ukrainian linguists who still go to conferences in Russia often express explicit pro-Moscow views in their work. One speaker from Odessa, for example, entitled a presentation he gave at Moscow State University, “The Ukrainian media’s stylistics in a period of acute political and economic crisis”. In it he not only used emotive language (“a disaster”) but said in his conclusion that “political experts and commentators can’t agree on what kind of war is going on in the east of the country. We read and hear the terms “civil war”, “hybrid war”, “war of conquest”, “interethnic war”, “undeclared war”, “internal war” and so on. And there’s no consensus in our government on how to define the tragic events that have been going on in Donbas for over two years”. In fact, Ukraine’s rulers reached a consensus on that subject long ago and never refer to it as a “civil war” – this is a term used exclusively by the Russian side. Russian and Ukrainian linguists who would like to find objective research on the conflict have discovered that their mutual neighbours in Belarus are eager to help. Svetlana Kuranova of Kyiv’s NAUKMA says that, “we are in pretty close contact with our colleagues there. And we can work together on a purely academic level, without politics getting in the way”. The Vinogradov Institute’s Olga Severnaya agrees. At a recent conference she attended in Graz, one of the speakers was Aleksandr Lukashanets, chair of the International Committee of Slavicists, whose presentation touched on various politically motivated neologisms such as “Khokhlostan”, a derogatory term used by pro-Russian elements for Ukraine (c.f. “Khokhol”, above) and “Downbas”, a derogatory variation on Donbas used by the pro-Ukrainian side (“Down” as in Down’s Syndrome). But the linguists believe that the people engaged in both sides of the conflict need to look at what it is doing to their languages. Svetlana Kuranova, for instance, is looking at the issue of linguistic identity and how ideology can influence personal relationships: “in time, scholars will study this issue dispassionately, but for the moment personal relationships get in the way. We need to be singing from the same hymn sheet – to be as objective as we can in our attitudes to one another. But for the moment, subjective non-linguistic factors are too strong for this to happen. The Russian language specialist and cultural historian Gasan Gusejnov believes that we need to try to rise above our emotions and get on with studying what he sees as an important issue: “The situation is very bad on both sides. The Russian side is of course entirely to blame, but now we have to look behind the headlines at the underlying reasons for the conflict. And for that we need to look at the language of hate. No one will ever know how exactly hate speech arises and spreads. Studies of the language of Nazism would be different without Victor Klemperer’s “The Language of the Third Reich”, just as Russian language studies would be without Andrey and Tatyana Fesenko’s “The Russian Language under the Soviets” (Russian link) or Julius Margolin’s “Travel to Ze-Ka”, which describes the language of the Gulag. I wouldn’t like to guess what might happen in the future. Over the spring and summer I hope to write in more detail about the roots and flowers of this linguistic erosion. But the fruits might appear before that”. Gusejnov recently finished a collection of essays about hate speech, which he wrote, as he says, to represent not “one side of the conflict”, but the side of “my Russian language from the rich resources of the Russian discourse of today”.